At the invitation of Han Zheng, Member of the Standing Committee of the Political Bureau of the CPC Central Committee and Vice Premier of the State Council, Mohammed Bin Salman Al Saud, Crown Prince, Deputy Prime Minister and Minister of Defense of the Kingdom of Saudi Arabia, will visit China from February 21 to 22. Vice Premier Han Zheng will co-chair with Crown Prince Mohammed the third meeting of the China-Saudi Arabia High-Level Joint Committee. At the invitation of State Councilor and Foreign Minister Wang Yi, Mahamoud Ali Youssouf, Minister of Foreign Affairs and International Cooperation of the Republic of Djibouti, will pay an official visit to China from February 19 to 21. At the invitation of State Councilor and Foreign Minister Wang Yi, Foreign Minister Chingiz Aidarbekov of the Kyrgyz Republic will pay an official visit to China from February 19 to 23. Q: Can you give us an update on the trade talks between China and the United States? Can you tell us will the two countries release a joint agreement or joint statement or a Memorandum of Understandings once the trade talks are finished? A: Please be patient for a little longer. The answer will be revealed very soon. Q: Just now you announced that Crown Prince, Deputy Prime Minister and Minister of Defense of the Kingdom of Saudi Arabia Mohammed will visit China. Could you tell us relevant arrangements and what expectations China has for this visit? A: During the visit, President Xi Jinping and Vice Premier Han Zheng will meet with Crown Prince Mohammed respectively. Vice Premier Han Zheng will also co-chair with Crown Prince Mohammed the third meeting of the China-Saudi Arabia High-Level Joint Committee. The two sides will sign a series of cooperation agreements. In recent years, the comprehensive strategic partnership between China and Saudi Arabia has maintained a sound momentum of development with deepening political mutual trust, fruitful practical cooperation in such areas as energy, infrastructure and space satellite, as well as closer people-to-people and cultural ties. Through this visit, we look forward to further strengthening the China-Saudi Arabia comprehensive strategic partnership, building greater synergies between our development strategies, deepening cooperation in various sectors under the framework of the Belt and Road Initiative, and having in-depth exchange of views on international and regional issues of common concern, to achieve greater progress in China-Saudi Arabia relations. Q: Around 45 Indian security personnel were killed in a terror attack in Kashmir yesterday. This is one of the worst terror attacks in the region ever. Pakistan-based Jaish-e-Mohammed has claimed responsibility for the attack. Indian has once again appealed to all countries to put this organization and its chief on the UN Security Council sanctions list. And now there is a growing clamor in India that China is not doing enough on the listing issue of Jaish-e-Mohammed's chief Masood Azhar. Do you think if India puts forward the application this year, China will rethink its decision? A: We have noted relevant reports and are greatly shocked by this attack. We express our deep sympathy and condolences to the bereaved families and the injured. 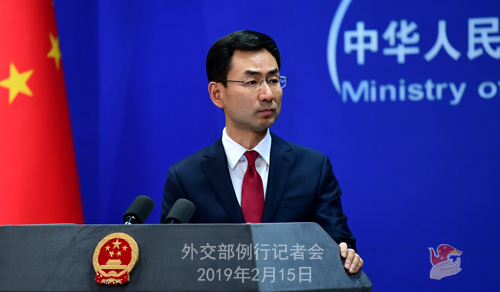 China firmly opposes and strongly condemns all forms of terrorism and hopes that relevant countries in the region could make joint efforts to combat terrorism and preserve regional peace and security. As for the listing of the certain organization and individual by the UN Security Council 1267 Committee you asked about, the UN Security Council 1267 Committee has detailed criteria for the listing and designation procedures for terrorist entities or individuals. The Jaish-e-Mohammed which claimed responsibility for this attack is already on the Security Council sanctions list against terrorism. China will continue to deal with the relevant listing issue in a constructive and responsible manner. 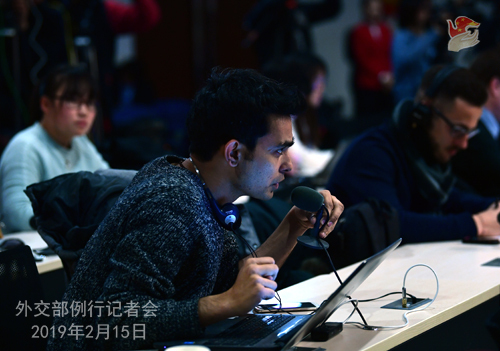 Q: The Wuhan Summit has led to a positive turn-around in India-China relations. Considering the bilateral relations have moved further after Wuhan, do you think that China would perhaps look at this case differently and can we expect a different outcome this year? A: I have already given you an answer. China has been acting in a constructive and responsible manner in dealing with this listing issue. The Jaish-e-Mohammed, which is a terrorist organization, is already on the Security Council sanctions list against terrorism. As for the listing of the relevant individual, China has been participating in the deliberations on this issue in an objective, unbiased and professional manner and in line with relevant UN Security Council resolutions and the rules of procedure of the UN Security Council 1267 Committee. We will continue to do so and remain in communication with all parties including India on this issue. Q: A China-New Zealand Year of Tourism event scheduled to take place this week in New Zealand was reported to be postponed. It is also said that China issued warnings against Chinese tourists travelling to New Zealand. The Prime Minister of New Zealand is still waiting for final approval for her visit to China. Can you tell us how is the relationship at the moment between China and New Zealand? Is it true that the Chinese tourists have been warned that they shouldn't go to New Zealand? A: As far as I know, China and New Zealand are in communications over arrangements for the 2019 China-New Zealand Year of Tourism event. As to China warning its tourists not to travel to New Zealand, where did you get that information or how did you come to that conclusion? Journalist: There is a Global Times article that is written in English this week. Some people have seen that and have interpreted it as the Chinese government saying Chinese tourists shouldn't go to New Zealand. A: I have not seen this Global Times article. And as a general principle, we do not comment on remarks by the press, think tanks, experts or scholars. You should know that we, not a Chinese newspaper, represent the official position of the Chinese government. As far as I know, the Chinese Embassy and Consulate General in New Zealand altogether issued three safety notices recently. The latest one is issued by China's Consulate General in Christchurch on February 8 on massive bush fires in the South Island of New Zealand. On January 14, the Chinese Embassy in New Zealand issued a safety notice for Chinese tourists traveling to New Zealand during the Spring Festival holiday. On December 7, 2018, China's Consulate General in Christchurch issued a notice reminding Chinese tourists and overseas Chinese to take precautions against robbery and theft. I don't think these notices can be interpreted as "warning" Chinese tourists against traveling to New Zealand. Those insisting on such an interpretation are evidently either making a big fuss over nothing or harboring ulterior motives. On bilateral relations, a China-New Zealand relationship enjoying sound and steady development is in the interest of both countries and peoples. China stands ready to work with New Zealand on the basis of mutual respect, equality and mutual benefit for new progress in bilateral relations. Regarding the New Zealand leader's visit to China, China attaches importance to having exchanges with New Zealand at all levels, including at the top. The two sides have been in contact on relevant issues. Q: Does China plan to continue using its position in the UN Security Council to block India's attempt to designate the chief of the Jaish-e-Mohammed? A: I already answered this question. The UN Security Council 1267 Committee has detailed criteria for the listing and designation procedures for terrorist entities or individuals. China will continue to deal with the relevant listing issue in a constructive and responsible manner. We will also keep in close communication with all relevant parties on this issue. Q: The United Nations Military Observer Group in India and Pakistan is mandated to monitor violations on the Line of Control from both sides at Kashmir, but India has not been allowing this group to work on the India-controlled side of the region. What is China's comment on this? A: We have repeated many times that as major countries in South Asia, Pakistan and India should properly resolve this issue through dialogue and consultation. We also hope that relevant regional countries will make joint efforts to combat terrorism and preserve regional peace and security. Q: Regarding Kyrgyz Foreign Minister's visit to China, could you tell us more about the arrangements for his visit as well as China's expectation? A: This is Foreign Minister Aidarbekov's first official visit to China. During this visit, State Councilor and Foreign Minister Wang Yi will hold talks with him. The two sides will exchange views on bilateral relations, BRI cooperation, the SCO and other issues of mutual interest. China and Kyrgyzstan are friendly neighbors and comprehensive strategic partners. Over the past 27 years since the establishment of diplomatic ties, China-Kyrgyzstan relations have been developing with a sound momentum. The two sides are enjoying close high-level exchanges, solid political mutual trust and fruitful BRI cooperation. We believe this visit will further move forward bilateral relations and cooperation in various fields. Q: There were newspaper reports in Britain that the Chinese government has canceled a round of trade talks with Britain following a speech by the UK Defense Minister. Is that true? And if so, could you explain the situation to us? A: I have not heard of that. Q: Venezuelan President Maduro said in an interview that he hopes to target Asian markets as destinations for Venezuelan oil, specially citing the continuing support of China. On the other hand, the President of Columbia said China's role in Latin America will be stronger if it recognizes the Venezuelan opposition leader. Does China have any response to either of these comments? A: Venezuela is China's important partner for economic and trade cooperation in Latin America, and companies of the two countries have been doing business based on the principles of equality, mutual benefit, common development and commercial rules. China will continue to advance across-the-board exchange and cooperation with Venezuela to deliver more benefits to our two peoples. 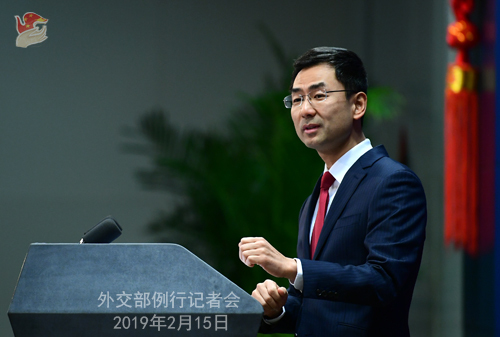 Regarding your question on the situation in Venezuela, China has been calling for efforts to facilitate dialogue within the framework of the UN Charter, and promoting dialogue and consultation between relevant parties in Venezuela for a political solution. Q: According to reports, You Xiaorong, an American scientist born in China, was arrested for allegedly stealing trade secrets from Coca-Cola. Her purpose was to set up a company to compete with US companies and win China's "Thousand Talents" award. What is your comment on this case? A: I'm not aware of that. I will see if I can get more information for you. Q: Venezuela's Foreign Minister said that a newly formed support group for the Maduro government, which includes China, will take actions in the coming days "to raise awareness around the dangers the Venezuelan people face". I was wondering if you could share details on what these actions might be and whether China's role in this support group means it won't recognize opposition leader Guaido? A: China supports the Venezuelan government's efforts to uphold national sovereignty, independence and stability, and calls on all sides to support the Venezuelan government and opposition in seeking a political solution through peaceful dialogue within the framework of the Venezuelan Constitution. We believe that all countries should uphold the purposes and principles of the UN Charter and refrain from interfering in other country's domestic affairs. Q: Just a clarification on your answer for the trade talks. You said the answer will be revealed very soon. By that do you mean today? A: Please be patient. I'm also waiting for more details to be released. Q: We learned that an employee of Japanese trading house Itochu was arrested by Chinese security authorities. Can you confirm that and share some information with us? China has taken measures in accordance with the law on the Japanese citizen suspected of violating Chinese laws. Following the China-Japan Consular Agreement, China maintains unimpeded consular communication with the Japanese side and provides necessary assistance for them to fulfill consular duties. I'd refer you to competent authorities for details of this case. Meanwhile, I hope the Japanese side can remind its citizens in China to respect Chinese laws and regulations and steer clear of criminal activities. 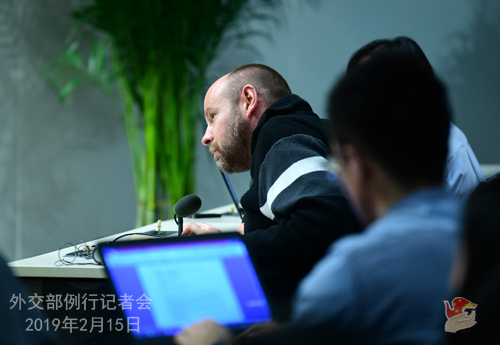 Q: Sweden has confirmed that its Ambassador to China is being investigated for alleged involvement in an unauthorized meeting with Chinese businessmen who claimed they were acting on behalf of the Chinese government for the case of Gui Minhai. Is China planning to investigate this case? A: The Chinese Embassy in Sweden has responded to this matter.